I went home to LA last weekend and not only was my weekend jammed pack running around the city running errands, my grandma and mom woke me up on Sunday morning telling me that they were going to make kimchi and that I better wake up if I wanted to watch. So random I tell you. My grandmother doesn't get a chance to make kimchi from scratch all that much so this was a special treat. Oh course she doesn't measure anything, so I don't have the exact measurements. It's all by taste and feel, but I hope the simplified tutorial will help. Here is a simple recipe for cucumber kimchi. I've been seeing Persian cucumbers everywhere, at TJ's and even at Korean markets. 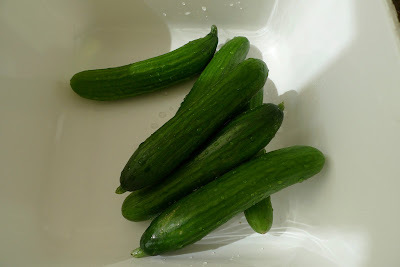 Koreans typically make cucumber kimchi with Kirby cucumbers, but Persian cucumbers have thinner skins, less seeds and a sweet taste to them, which makes them great substitutes for Kirby cucumbers. 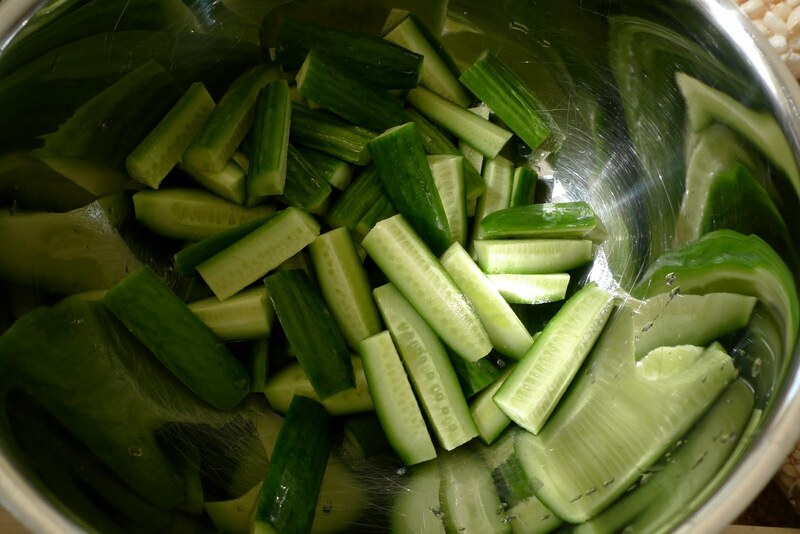 Chop off the ends and cut the Persian cucumbers into halves or thirds (depending on how long they are). Cut into quarters length wise until they look like the picture below and place in a big bowl. 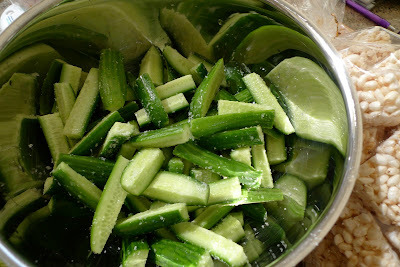 Salt them with coarse or kosher salt. 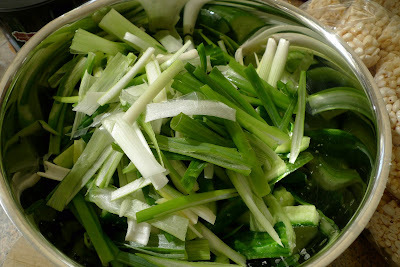 Meanwhile cut up some Korean chives in approximately the same length of the cucumbers. My grandmother says cucumbers and chives go really well together. I would have to agree. 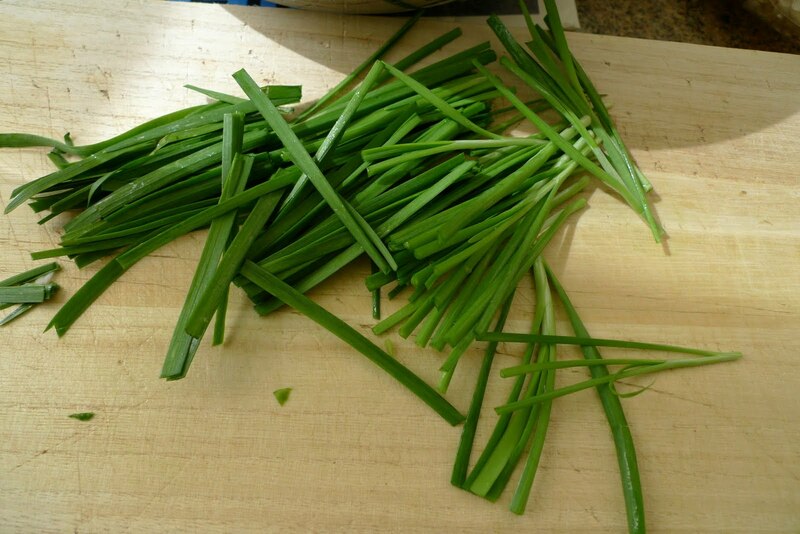 Cut the green onions into pieces as well. You can cut the white parts into smaller pieces since they tend to be spicier than the green parts of the onion and add to the bowl. Add in the red pepper flakes, garlic and sugar to taste and mix together. There you have it, a wonderful kimchi side dish made in literally minutes. 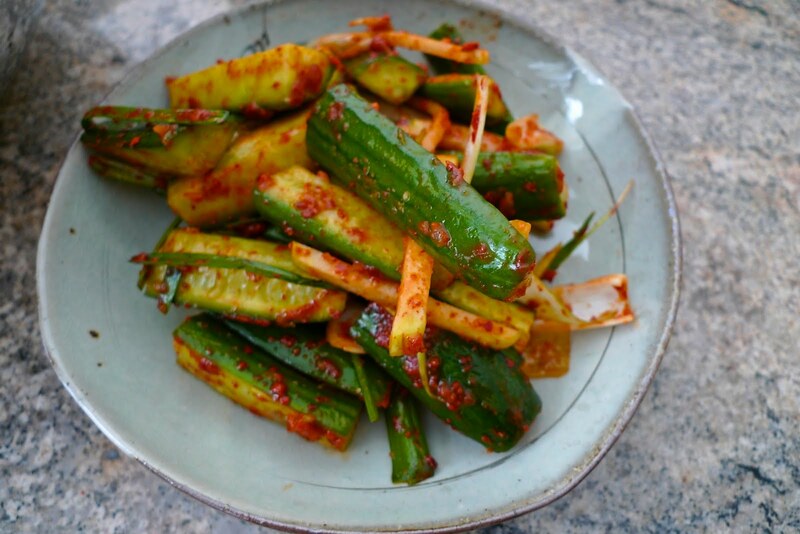 There's no excuse not to make kimchi anymore. You can do it!